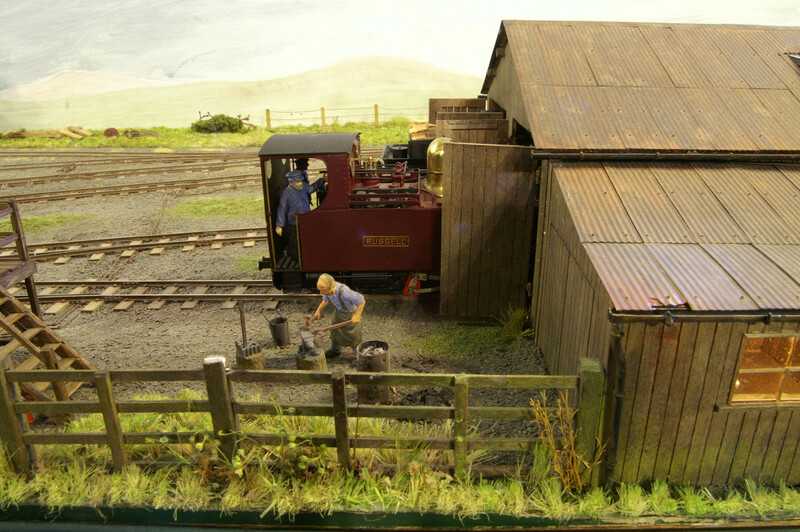 This layout portrays part of the 2 foot narrow gauge railway at Dinas Junction station, the northern terminus of the North Wales Narrow Gauge Railways company’s line to Rhyd Ddu. (South Snowdon in later years). It is modelled as it is thought to have been in the early part of the 20th century, and is based upon plans and photographs. This railway was eventually incorporated into the ill-fated Welsh Highland Railway in 1922. However, it is now the focal point of the new expanding Welsh Highland Railway, which is now one of the most impressive narrow gauge railways in the British Isles. The right hand portion of this layout has been exhibited many times in the area under its original name of ‘Dinas Ddu’, and showed the approach to the station. 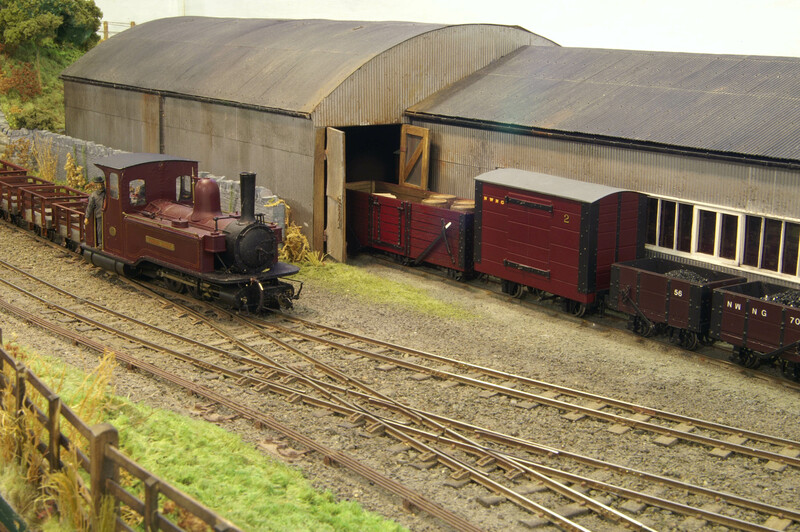 However it has now been expanded to include most of the station up to the end of the goods shed. However, there has never been any intention of trying to model the standard gauge section of the station, which in this scale would be extremely large. The intention has always been to model everything virtually from scratch, and this has largely been accomplished, the unusual scale of 8mm=1ft leaving little option. The track is spiked to wooden sleepers in the prototypical manner, the ballast being produced from crushed slate. The locomotives have been constructed from nickel silver and brass, closely following the dimensions on the manufacturers’ original drawings. Coaches and wagons are constructed from wood, nickel silver or plasticard on brass/nickel silver underframes. Stonework on the buildings has been produced by building up layers of polyfilla onto a scribed plaster base, the resulting textured finish being painted in water colours. The corrugated iron for the sheds was produced from Slater’s sheet, suitably trimmed and pinned. Grass is made from individual clumps of plumber’s hemp, although some experiments with the modern static grass methods have been incorporated. The model was first started in the early 1980s; although virtually complete, there is still potential for more scenic development. The increased size of the layout also means that an increased amount of rolling stock can be used. This is particularly the case as a new layout based on Rhyd Ddu station (Snowdon NWNGR) is no complete and the hope is that the two will be joined together at some time in the not too distant future. 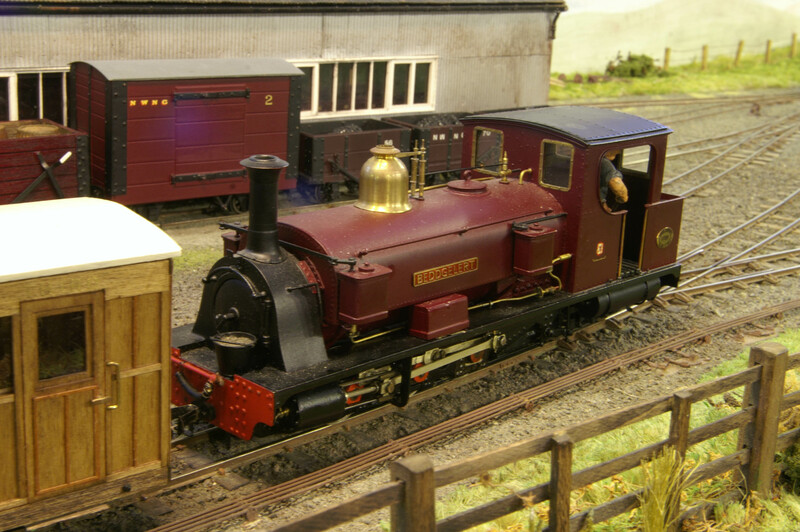 The owner/builder has been a member of the 7mm Narrow gauge Association for many years and has found inspiration and enjoyment from being associated with this excellent body. Membership is recommended for anyone modelling in the larger scales.